Gnarly Leash Ties are new. Surfers like myself find that we can only get a leash tie by either buying a leash ($20) or a new pair of baggies ($50). The truth is that before Gnarly Leash Ties, “free” leash ties have been really expensive. The ones on the market aren’t that strong either, and they snap. There has also been a lack of variety in leash tie color. Gnarly Leash Ties come in a variety of colors, and you can buy 1 or 100. They’re also made of 400-pound tested parachute rope. People trust their lives to this material, we trust it to hold our surfboard. FREE SHIPPING FOR ORDERS OVER $10.00! 4 Leash Ties for $8. Get all four colors. WANT FREE SHIPPING? 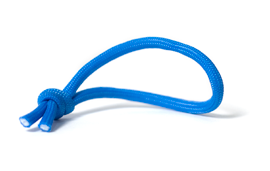 Order more than $10 of leash ties, and shipping is free. Gnarly Leash Ties are super strong! They’re 400-pound tested parachute rope. Sky divers trust their lives to this rope, so we trust it to hold onto our surfboards. They’re better than any leash tie you’ve ever used. If you want to carry these in your surf shop, or want to see them in a local surf shop, I can be contacted using this form. So you go to your favorite surf shop and what do you find? They tell you that to get a new leash tie you have to either buy a new leash (way too expensive for this little rope) or buy a pair of baggies that come with a complimentary leash tie. Either way you’re looking at spending $20-50 just to get this leash tie. And that’s all fine and dandy for surf companies, but what about us? We just need a freakin’ leash tie and we’re not rich! Last time I needed a leash tie, the guy at the surf shop basically stole one out of a pair of baggies and sold it to me for $2.50. There are two problems with this. First off, what about the person who buys those baggies and doesn’t get the leash tie they expect? Also, $2.50 is a lot to pay for that little rope! One other problem I have with leash tie’s is that there’s no variety. They’re always black! What if I want a red or a blue one? Why isn’t anyone addressing this problem? 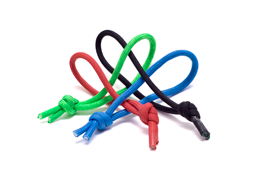 I want to go to a surf shop and buy 1, 2, 3, 4, or 5 surf leash ties at a decent price and even pick out the colors I like. 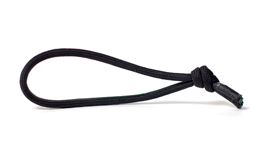 I’m introducing surf leash ties in a variety of colors, at a great price: 4 leash ties for $5. That’s only $1.25 each, and these things are even tested for 400 pounds of pressure, so you can count on them to hang on to your surfboard. When they sell out, I’ll buy other colors, like orange, maybe some camouflage, and whatever else you tell me you’d like to see. NOTE: If you seriously want to carry a surfboard (or just about anything else on your motorcycle), you need to read the blog on Surfer Pegs.